What Do Happy Meals and Your FICO Score Have In Common? Who wins the stock market’s “epic tug of war”? Burning mailbag questions: Would the Chinese “shoot themselves in the foot”? Why does Washington support Saudi Arabia? Wait a minute… a Happy Meal is no longer value-priced? But the website’s on-the-ground sources report the price of a hamburger Happy Meal in Los Angeles is up to $3.99… and the four-piece Chicken McNugget Happy Meal is $4.59. As we documented at the time, McDonald’s slowly killed its Dollar Menu from 2013–15 after more than a decade; franchisees screamed that the prices were crushing their already-slender margins. These days, if you want something other than a beverage for $1, your only choices are the cheeseburger, McChicken, Sausage Biscuit and Sausage McMuffin. But the price bump on a Happy Meal feels like something different. It feels like corporate America is confident it can raise prices on iconic products without driving customers away. It feels like something that happens during the late boom phase of the boom-bust cycle — which is how we’ve been describing the markets and the economy all this year. Here’s another marker of a late-stage boom: It looks as if sales growth across corporate America might be slowing. So far during the current earnings season, 85 of the S&P 500 companies have reported their numbers. Profits look great… but that’s a number gamed easily by clever accountants. Sales — revenues — are another thing altogether. And according to FactSet, 35% of the companies reporting so far have missed the vaunted “analyst estimates” on revenues. Slowing sales ultimately lead to slowing profits, no matter what the accountants do. And slowing profits — eventually — lead to lower stock prices. But because it’s still a boom for the time being, credit is easy — so easy that your FICO score might be about to jump without you lifting a finger. In addition to your payment history on money you borrow, this supposedly new-and-improved score will incorporate the way you handle your savings, checking and money market accounts. The change, according to the Journal, will have the effect of “likely boosting many applicants with less-than-ideal records.” All you need to do is keep an average balance of at least $400 and not be overdrawn for three months. For lenders that means more approvals for credit cards, personal loans and other debts. No, it’s not the equivalent of the “fog a mirror” mortgages from 2005–06. (As in, “Can you fog a mirror? Here, have a zero-down mortgage!”) That was an epic extreme of easy credit. But in general, looser credit standards are part and parcel of a late boom cycle. We’re much closer to the end of the boom than the beginning. The choppy market action of October — yet another hallmark of the late boom phase — is carrying on into a new trading week. At last check the Dow and the S&P 500 are down about a half a percent, while the Nasdaq is slightly in the green. On Friday, the Dow was the only major index to eke out a small gain. Gold is inching down to $1,221. Crude has slipped to $68.73. “An epic tug of war is taking place right now between bulls and bears,” says our Mike Burnick. “Supporting the bullish camp is another quarter of stellar profit growth. Based on actual results and estimates, third-quarter earnings for the S&P 500 are on track to jump 19.1% year over year, with the second-highest net profit margins in the last 10 years! At last check this morning, the S&P 500 rests at 2,756. 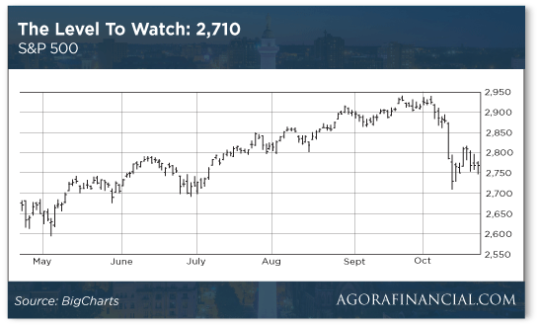 Mike says the key level to watch is 2,710. On this chart of the index’s “intraday” action, that’s the three-month low reached earlier in October. [Ed. note: Whatever the next few weeks bring, Mike has literally written the book on how you can lock down steady, reliable income no matter what the market does. It’s called The Little Black Book of Income Secrets… and it’s packed with timeless guidance that will help you navigate both bull and bear markets. Ronald Reagan is rolling in his grave… and our theory that present-day Washington is pursuing a policy of constant confrontation with China is growing ever stronger. As you might have heard, over the weekend Donald Trump announced the United States is withdrawing from the Intermediate-Range Nuclear Forces Treaty. 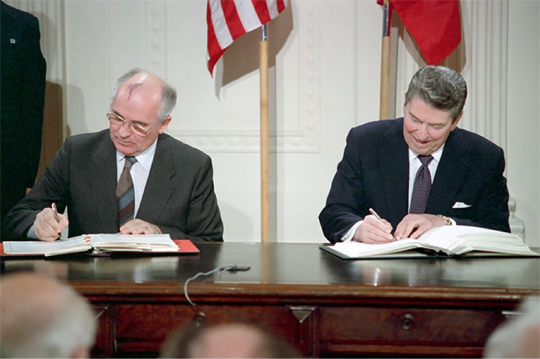 The INF Treaty, signed by Reagan and the last Soviet leader, Mikhail Gorbachev, was the first and only arms treaty that eliminated an entire class of nuclear weapons — those atop land-based missiles with ranges of roughly 300–3,400 miles. The treaty was perhaps Reagan’s greatest legacy, born of a profound fear for the planet’s future: “A nuclear war cannot be won and must never be fought,” he said in his 1984 State of the Union address. But hey, what did those fogies from the WWII generation know? By the time U.S.-Russia relations were seriously going south in 2014, Barack Obama’s hip, cool advisers got it in their heads that Russia under Putin was violating the treaty’s terms — although they were never able to prove it. Trump reminded the media of that more recent history when making the announcement Saturday. “I don’t know why Obama didn’t negotiate or pull out,” he said. Perhaps the reporters’ heads were too busy exploding, trying to reconcile this new development with their “Trump is Putin’s stooge!” narrative. Then again, withdrawal from the treaty might not be exclusively about Russia. It might be about China just as much. That was the gist of a New York Times story on Friday foreshadowing the announcement. China was not a signatory to the treaty; in 1987 China was still a backwater compared with what it is today. This is the military side of the constant-confrontation coin. The conceit in Washington — among both Trumpians and the Deep State — is that the Pacific Ocean is an “American lake.” For China to assert itself militarily in its own backyard — especially the South China Sea — is more than anyone in the D.C. swamp can stomach. From here, it looks like absolute madness: As Jim Rickards has suggested in our digital pages before, it’s a maxim of diplomacy that if you’re one of three great powers jousting for position on the global stage… you try to bring one of them onto your side to counter the other. “I doubt the Chinese are going to shoot themselves in the foot,” a reader writes after our constant-confrontation take in Friday’s 5. “Devaluing the yuan increases the cost of imports, which hurts consumers and industries in China. Lowering revenues from exports also hurts Chinese businesses’ profits. “Kicking out Apple and GM would cost hundreds of thousands of Chinese jobs. It would be political suicide. The 5: Yes, we were engaging in an extreme thought experiment with the notion of China kicking out Apple and GM. Even in a worst-case scenario, it would be foolhardy for the Chinese. Having said that, it was also foolhardy for the Japanese to attack Pearl Harbor. But FDR had cut off their access to oil. Desperate governments resort to desperate measures. “What will it take to see that the Saudis are not our friends?” a reader writes on a hot topic in the mailbag last week. “I am not an expert, but as I recall 15 of the 19 hijackers responsible for 9/11 were from Saudi Arabia, and look at the American lives that were lost then. The 5: Two days after Sept. 11… President Bush smoked cigars with Prince Bandar, the Saudi ambassador to the United States, on the Truman Balcony of the White House. We now know from the redacted “28 pages” of a joint congressional inquiry that there was a fairly direct money trail leading from Bandar to the San Diego cell of hijackers that crashed into the Pentagon. Heck, the U.S. military captured an al-Qaida leader in Pakistan in 2002… and found in his contact list the phone number for a cutout company that managed Bandar’s palatial spread in Aspen. It’s preposterous that the death of a journalist is proving the tipping point for the D.C. establishment compared with everything else the Saudi regime does and has done. We noticed over the weekend The New York Times ran a photo montage to accompany a Maureen Dowd column — showing Presidents Trump, Obama and Bush all bowing before the Saudi king to receive to receive medals. It was a striking series of images. But — umm — it wasn’t the first time anyone had the idea to show them all at once. P.S. When we ran that montage in May of last year, we mentioned the $110 billion in arms sales to Saudi Arabia that Trump was so proud of. And the fact there weren’t any signed contracts, nor even a time table for signed contracts. Nearly 18 months later, the whole thing looks like smoke and mirrors. The total of “done deals” so far looks to be somewhere between $4–4.5 billion. Big whoop.